18 • ROCK products • November 2018 www.rockproducts.com FRAC SAND INSIDER Vista to Develop Oklahoma Sand Mine Vista Proppants and Logistics LLC announced the devel- opment of a 1- to 1.5-million-tpy frac sand mine northeast of Fay, Okla., to serve customers primarily operating in the Mid-Continent region's SCOOP and STACK oil and gas plays. The company has completed the purchase of the 1,150-acre site, which is located on Highway 33 and has ready access to water, electricity and natural gas. Vista recently filed permit applications and will begin construction following permit approval. Gary Humphreys, Vista chief executive officer commented, "Our development of an in-basin mine in the underserved SCOOP and STACK plays is the next step in Vista's long-term strategy to provide customers a broader-based, truly differ- entiated mine-to-wellhead solution for their frac sand needs. 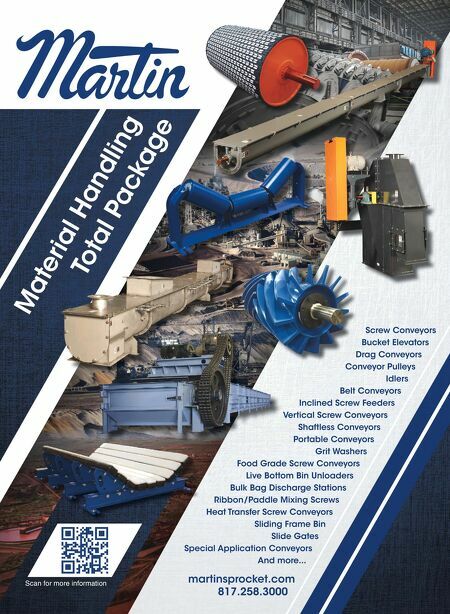 We plan on producing both 100 mesh and 40/70 products with solid crush and other characteristics designed to best serve the growing need for in-basin sourced frac sand. Sim- ilar to our three other mines, we will utilize trucking and our strategic footprint of transload facilities to efficiently deliver product and better serve E&Ps and oilfield service companies operating in the region." Separately, the company provided an update on the expan- sion of its West Texas mine facility located in Winkler County. Operations at West Texas commenced in March 2018 and the mine is operating at its initial capacity run rate of 3 million tpy. In August, the company received its New Source Review permit that allows for the expansion of production capacity by an additional 2 million tpy. This will bring total produc- tion capacity for West Texas to 5 million tpy. 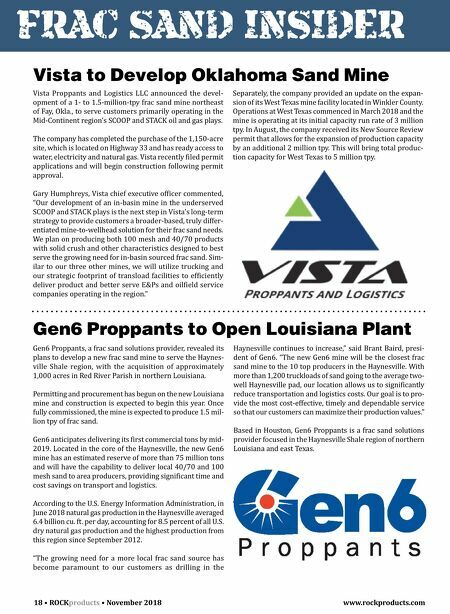 Gen6 Proppants to Open Louisiana Plant Gen6 Proppants, a frac sand solutions provider, revealed its plans to develop a new frac sand mine to serve the Haynes- ville Shale region, with the acquisition of approximately 1,000 acres in Red River Parish in northern Louisiana. Permitting and procurement has begun on the new Louisiana mine and construction is expected to begin this year. Once fully commissioned, the mine is expected to produce 1.5 mil- lion tpy of frac sand. Gen6 anticipates delivering its first commercial tons by mid- 2019. Located in the core of the Haynesville, the new Gen6 mine has an estimated reserve of more than 75 million tons and will have the capability to deliver local 40/70 and 100 mesh sand to area producers, providing significant time and cost savings on transport and logistics. According to the U.S. Energy Information Administration, in June 2018 natural gas production in the Haynesville averaged 6.4 billion cu. ft. per day, accounting for 8.5 percent of all U.S. dry natural gas production and the highest production from this region since September 2012. "The growing need for a more local frac sand source has become paramount to our customers as drilling in the Haynesville continues to increase," said Brant Baird, presi- dent of Gen6. "The new Gen6 mine will be the closest frac sand mine to the 10 top producers in the Haynesville. With more than 1,200 truckloads of sand going to the average two- well Haynesville pad, our location allows us to significantly reduce transportation and logistics costs. Our goal is to pro- vide the most cost-effective, timely and dependable service so that our customers can maximize their production values." Based in Houston, Gen6 Proppants is a frac sand solutions provider focused in the Haynesville Shale region of northern Louisiana and east Texas.